December’s MP of the Month blog charts the path into Parliament of George Thompson, a self-educated book-seller’s son. As one of Britain’s foremost platform orators he was a major figure in the abolition of slavery in the West Indies and the United States, as well as an early campaigner for Indian independence. Born in 1804, George Thompson was educated by his father, a Lambeth book-seller and ‘man of refined manners, and extensive reading’. Working at a City counting house from the age of twelve, he immersed himself in London’s self-improvement culture of the 1820s, distinguishing himself as a public speaker at the London Mechanics’ Institute from 1823. He got his big break in 1831, when he was recommended by the Lord Chancellor, Henry Brougham, for the role of travelling speaker for the London Anti-Slavery Society. With ‘his voice pealing like a trumpet’, ‘perspiration dripping from his head’ and his imposing frame ‘throbbing with emotion’, Thompson’s speeches for the society drew increasingly large crowds. His status as a national celebrity was established in 1833, when he distinguished himself in a series of week-long debates in towns across Britain with the slavery advocate and future MP for Evesham, Peter Borthwick. 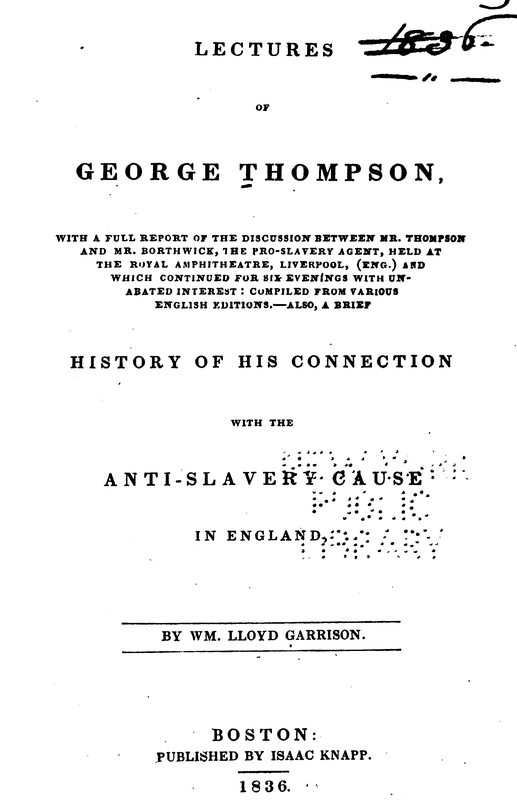 After the abolition of slavery in the British colonies in 1833, Thompson turned his attention to worldwide abolition. In 1834 he was invited on a lecture tour of the United States by the American abolitionist William Lloyd Garrison. During an infamous 15-month tour his ‘vitriolic harangues’ against slavery and rumours surrounding his questionable financial dealings attracted widespread coverage, eventually leading to his denunciation by President Jackson, forcing him to flee the United States in November 1835. On his return to Britain he supported the radical Quaker, Joseph Sturge, in his campaign to abolish slave apprenticeships, before taking up the cause of slavery in India. In 1839 he helped establish the British India Society, whose aim was to make ‘known the wrongs’ of the ‘80,000,000 of people’ in India and to expand ‘Indian cotton sails in order to undersell slave-grown Cotton from the United States’. Firmly established as one of Britain’s foremost political agitators, Thompson lent his services to the Anti-Corn Law League as part of an agreement with the British India Society in 1841, organising a ‘national convocation’ of ministers from all Christian denominations in order that the League could ‘gain access to their chapels & associations & sanction the public co-operation of the women’. At the convocation, Thompson called for a female petition to the Queen (which secured a quarter of a million signatures), and asked ministers from across the country to arrange meetings of women at which he could lecture. Speaking in support of ‘universal emancipation’ at these meetings, his ‘impassioned language and thrilling accents … secured him great favour from female audiences’. 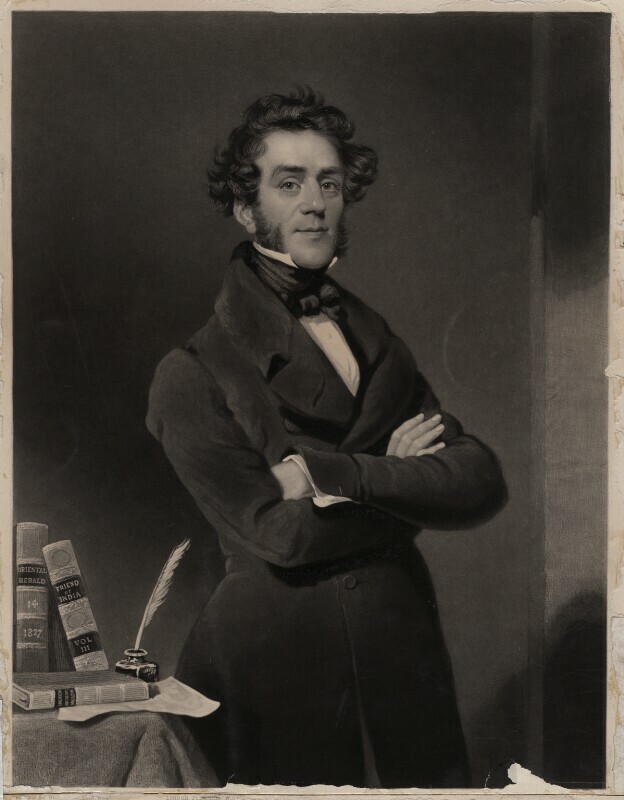 After two years of campaigning for the League, Thompson made his first attempt on Parliament, accepting an invitation to stand at the 1842 Southampton by-election. Coming forward on ‘liberal principles’, he promised to support the Chartist cause and ‘the total annihilation of the corn laws’, but was defeated by two Conservatives. Later that year, he travelled to Calcutta under the patronage of an Indian merchant, Dwarkanauth Tagore. Occupying an entire floor of Tagore’s townhouse in the centre of Kolkata, where he became known as ‘Hindoo Thompson’, he immersed himself in Indian law, offered counsel to the locals, and started campaigning for Indian land reform through the Bengal British India Society. In 1846, the freed slave Frederick Douglass stayed at Thompson’s home at Whiteheads Grove, SW3. Back in England by February 1844, he resumed campaigning for the Anti-Corn Law League. After the successful repeal of the corn laws he renewed his crusade to abolish slavery in the US, establishing the Anti-Slavery League in August 1846 with William Garrison and the freed slave, Frederick Douglass, who had been using Thompson’s home as his London residence. Although this new organisation failed to capture momentum in Britain, Thompson maintained a life-long commitment to the abolition of slavery in the US and was reportedly the ‘only foreigner’ in attendance on 14 April 1865, when the Stars and Stripes were raised at Fort Sumter. In 1847 Thompson’s national status prompted invitations to stand at that year’s general election at Leicester, Westminster, Lambeth and Tower Hamlets. He eventually came forward for Tower Hamlets, which contained Britain’s largest registered borough electorate of almost 19,000 voters. 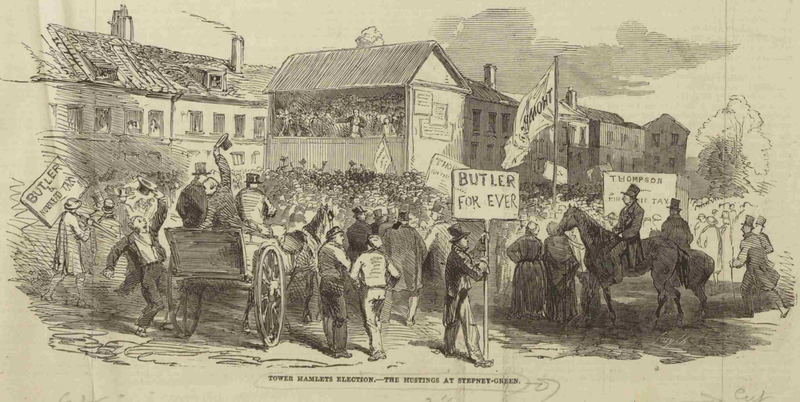 The hustings at Tower Hamlets in 1852 where Thompson had topped the poll five years earlier, ILN, 10 July 1852. At a series of huge public hustings he called for a further extension of free trade and religious rights, extensive parliamentary reform, retrenchment, disestablishment and secular education. In one of the most notable results of that year’s election, Thompson defeated both of the borough’s moderate Liberal incumbents by 2,500 votes, prompting election officials to report with amazement at how ‘whole pages of votes’ were ‘filled entirely’ with ‘plumpers for Mr George Thompson’. You can find out how Thompson’s parliamentary career progressed in his full biography, which will be published shortly on our free preview website. For details of how to obtain access to this or any other of our completed articles please click here. This entry was posted in Elections, MP of the Month, women, Working-class politics and tagged Abolition of slavery, Abolitionists, American Civil war, Anti-Corn Law League, British India Society, Dwarkanauth Tagore, Female participation, Frederick Douglass, George Thompson, indian independence, Lord Brougham, March of Intellect, slavery, Southampton, Tower Hamlets. Bookmark the permalink.